Treat your birds like royalty by offering them shelter in this Heartwood Gray Imperial Inn Bird House with Turquoise Door. The square body and striking color scheme bring a majestic look to your backyard, completed perfectly by the pagoda style roof with large shingles and copper accents. This flared roof not only captures attention; it also adds a hint of the Far East to your garden and provides height to the shelter. Horizontal lines throughout the light gray body create the look of lapped siding, while a 3.5" diameter cut out sports a bright turquoise tone for interest. A 1.5" diameter entry hole also rests within this circle, allowing bluebirds or small woodpeckers access to the unit. The significant roof protects the compartment from rain, while also helping it remain ventilated, and the shape provides plenty of room for an avian family. A back disc removes for seasonal cleaning or nest checks, and the cypress body forms a lasting shelter. The bright turquoise front accent lends a bold hint to your yard, perfectly contrasting the light gray body. 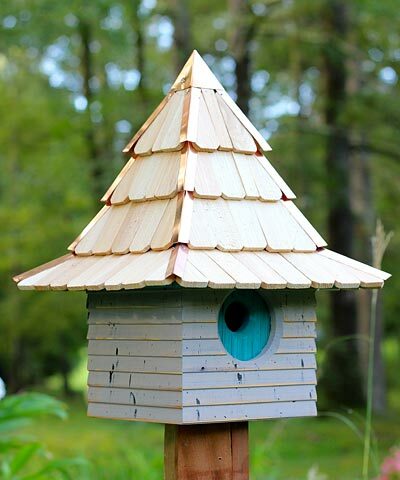 Use the included mounting plate to place this home on a 4 x 4 post, and enjoy the copper roof cap and ridge lines capturing sunlight for added style. Showcase your love of birds by adding this Gray Imperial Inn Bird House with Turquoise Door to your garden. Made in the USA.